As I have mentioned before, my hubby and I just moved into our retirement home a couple of years ago. We went through the entire building process and waited 7+ months for our new home to be built. The reason we went with the new build is because we found a pretty piece of property with a good many acres (hubby’s wish) in a neighborhood, in a cul-de-sac (my wish) and we were also able to make every single choice that would make it our own. 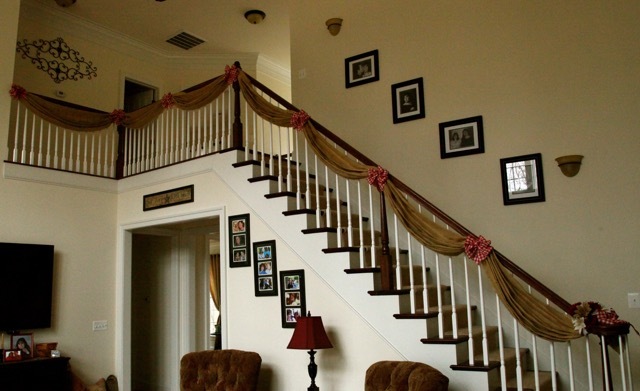 There were many reasons why we chose this model to build not the least of which was this pretty staircase. 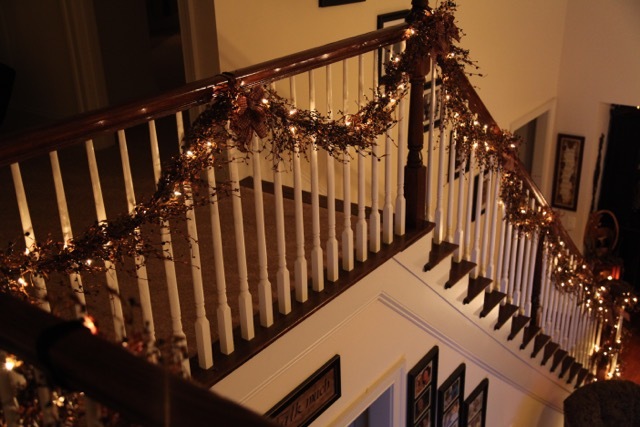 I had had staircase railing decorating ideas flying around in my head for the entire time that the house was being built. 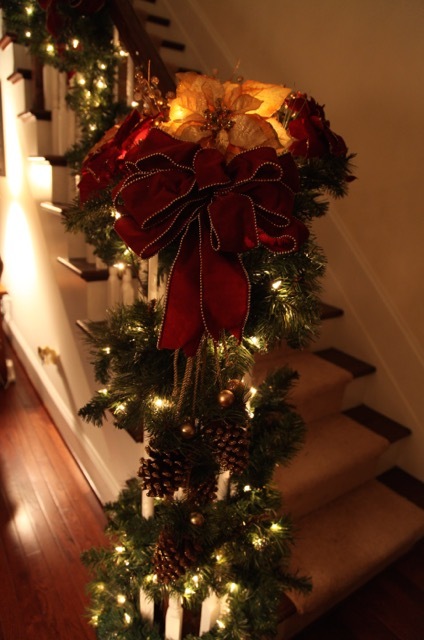 One of the first ideas that came to fruition was a burlap swag idea that I’d seen somewhere on Pinterest. 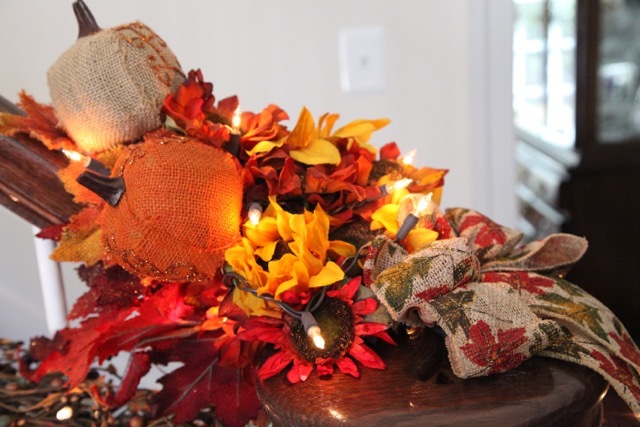 We did it our way and we started with a bolt of burlap fabric that I found at Joann’s Fabric. My hubby and I laid out burlap on the floor (I wish I could remember how many yards I purchased, but I’m sorry to say that I cannot–we did use an entire bolt though) out into one long piece and folded it accordion style and wrapped masking tape around it every so often to keep it folded in place until we hung it up. 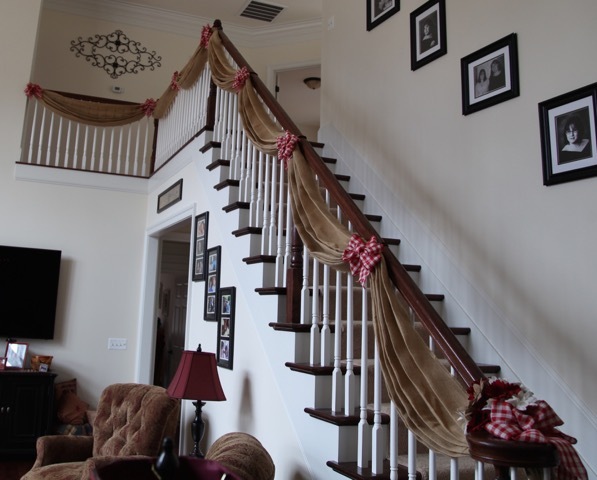 Once that was completed (no easy task honestly) we evenly draped it like you would a swag curtain between each post on the staircase and then took the masking tape off and tweaked each swag until it looked like we or I had envisioned. 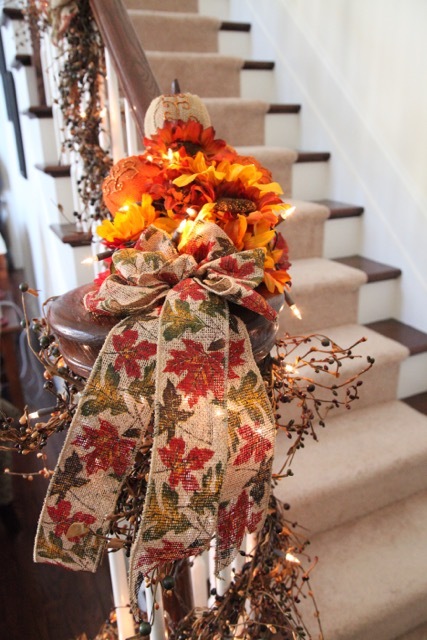 I also made a flower arrangement and attached it to the bottom and on top of the bullnose section of the staircase; that pulled it all together nicely. I then made bows and attached them to all of the swag points; I loved how it turned out and I kept it up for quite some time. 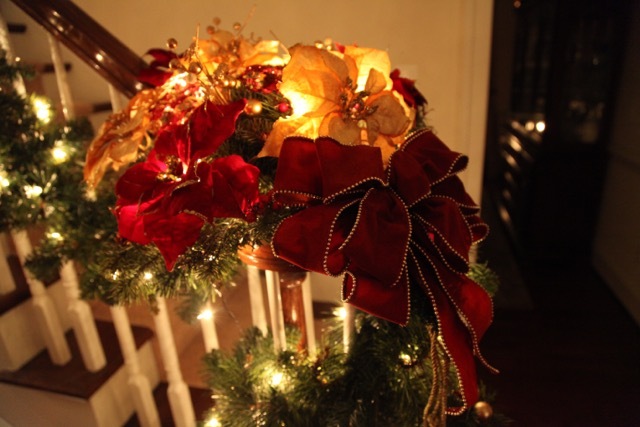 Of course Christmas decorating was next. 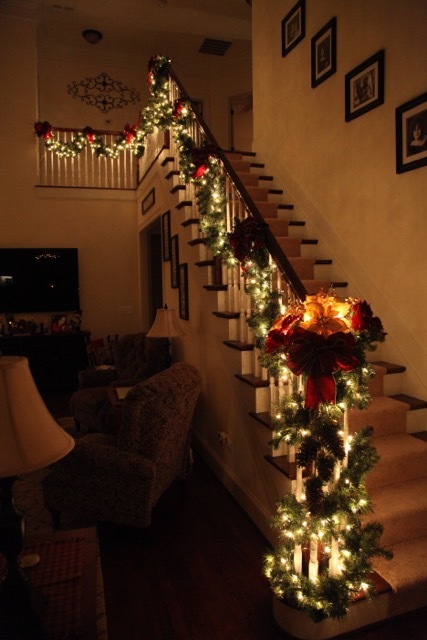 We removed the burlap and replaced it with pine garland wrapped in white lights, I made new Christmas bows, and a new arrangement for the bullnose. 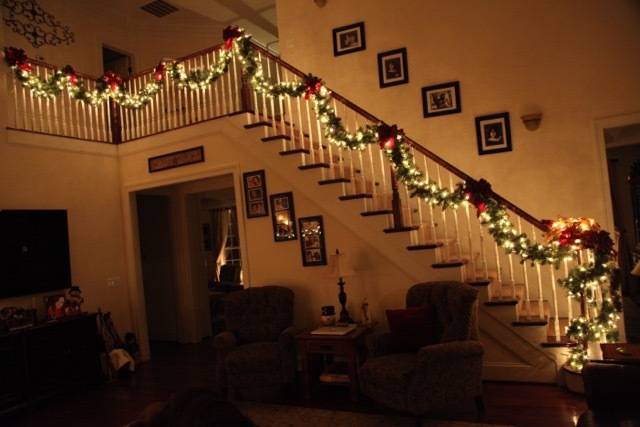 I really loved how those lights looked, so, so pretty. 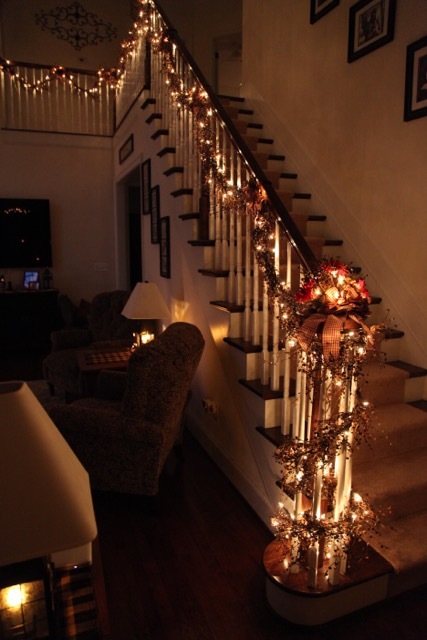 My hubby also attached a remote control to the lights so that we could turn them on and off at will; that was so convenient. 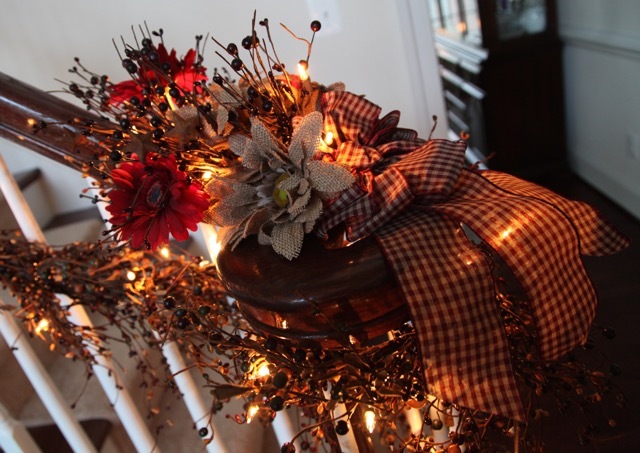 Of course I made new bows out of burgundy checked wired ribbon which matched the ribbon that I’ve used in many a centerpiece, arrangement, and wreath throughout our home. I purchased the ribbon online too because I couldn’t find what I knew I wanted around here. This is the ribbon that I purchased. 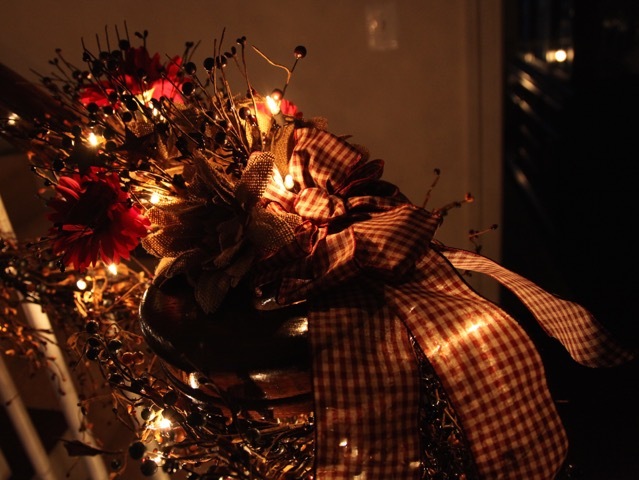 And then I made a new flower arrangement out of burgundy and burlap gerber daisies and pip berry picks, wrapped white lights around that arrangement and tied it all together with a bow. This is what hangs in our house for my “regular” or “generic” decor. 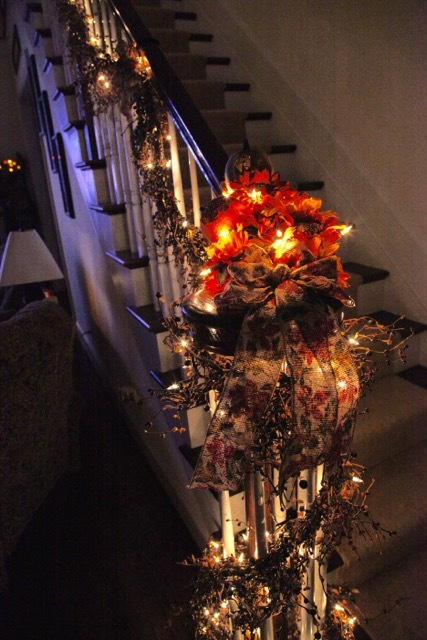 I only change out the bows and flower arrangements for Fall and Christmas now-a-days; I love the look *that* much! 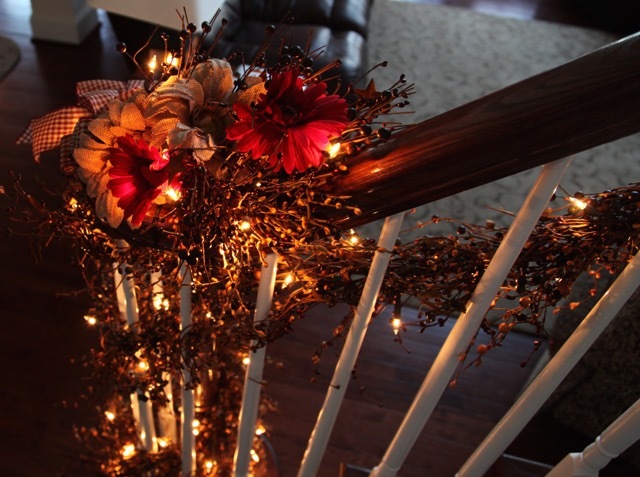 When I see how beautifully you decorate your stairs, I want a set! I wish I could build you a set sweet lady! 🙂 Thank you so much for your lovely words!! 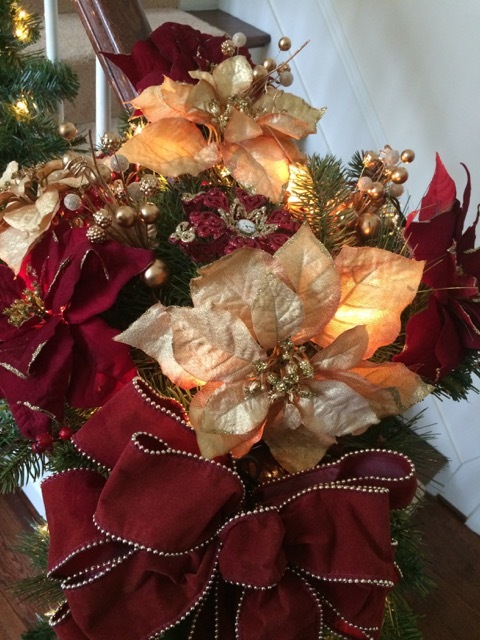 Oh my, I’m in Burlap heaven😍 You’re so talented at decorating and it’s exactly my style, absolutely gorgeous. 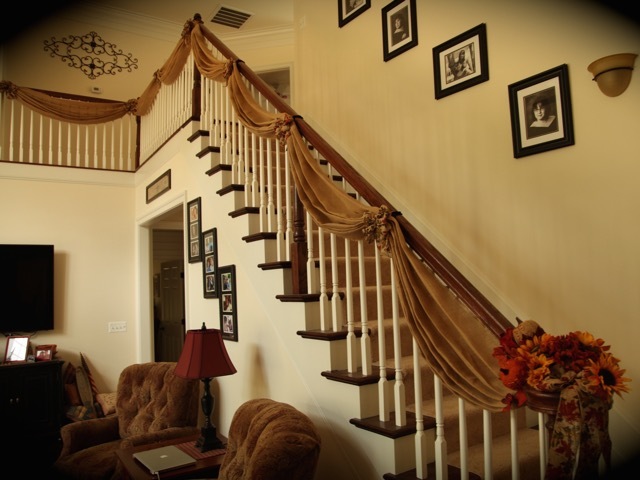 I’m doing my stairs this week, as I’m burlap-inspired, so thank you for sharing.